Michael’s book is Funny, You Don’t Look Autistic, Roland’s A Message from A Fool. As much a book of a fascinating portrayal of his life so far, Funny, You Don’t Look Autistic is, almost a how-to book. Michael has provided a much needed, much appreciated book about being autistic from his side of the spectrum. 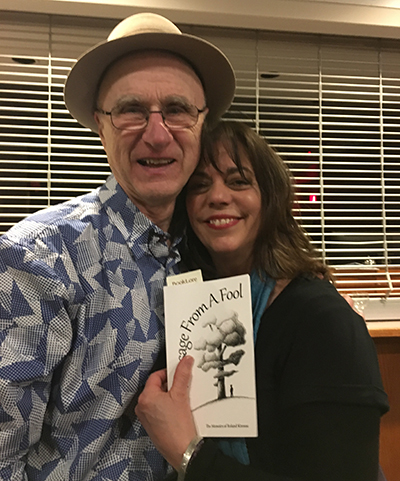 He leads his reader through his own life and times, from his use of language as a tiny child – lines from movies – to his first jokes at elementary school, to his cross-Canada tour. Travelling with his father from coast to coast, Michael’s take on the audiences and his own part in their entertainment is sometimes very funny and, sometimes real food for thought. Imagine that you can’t remember any of your birthdays before your 15th. On that specific day, you are walking home, to an abusive home with a deaf, beaten mother and a brutal alcoholic father, when suddenly you stop. Just there, on that spot, which is just a spot with no significance until this very second and, in that second, your life is transformed by the revelation that comes to you, by the message from a non-corporal fool. This is the beginning of Roland Kirouac’s presentation of A Message from a Fool, through which he danced all the time, a graceful, flowing ballet, with his story telling to match, that kept us completely in his grasp. His passion, his pain, his tremendous joy. This evening was, as have been all the authors’ events at the theatre, a collaboration between BookLore and Theatre Orangeville. Needless to say, Funny, You Don’t Look Autistic, by Michael McCreary and Message from a Fool, by Roland Kirouac are both available at BookLore.